All of our barges offer the same exceptional standard of cuisine, wine, excursions and service – so no matter what category of barge you choose, you can rest assured you will be receiving the same outstanding cruise experience! As a guideline, on a Deluxe category barge you may expect to find good sized cabins ranging from 91 – 165 sq. feet, and well-equipped bathrooms will range from relatively small to a very comfortable size. All Deluxe barges have a jacuzzi on deck and will have large salon and dining areas with beautiful decoration, ranging from traditional to contemporary style. 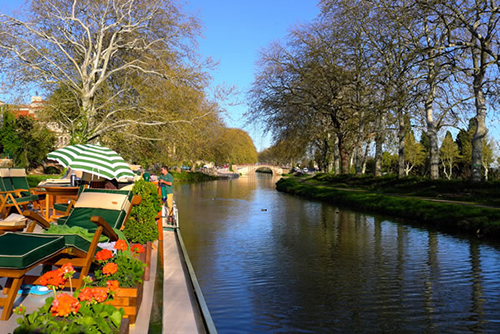 Our Deluxe barges are superb, and offer a wonderful barge cruise holiday. This beautiful barge offers a magnificent itinerary including some of the most famous historic sites in southern England – Hampton Court Palace, Windsor Castle and Henley-on-Thames – and some departures include a visit to Downton Abbey! The beautiful hotel barge Panache cruises in Holland during Tulip Season & includes a visit to the world famous Keukenhof Gardens & Aalsmeer flower auction!